For all those little girls (and boys too perhaps?) who can’t stop singing ‘Let it go, let it go, can’t hold it back any more…”, Cakes by Robin can create the most amazing Frozen birthday cakes. Disney’s 2013 hit Frozen is the most successful animated movie of all time, so it’s little wonder that the enchanting characters from the film have melted children’s hearts everywhere. Cakes by Robin are experts at designing children’s birthday cakes that are as yummy as they are adorable. 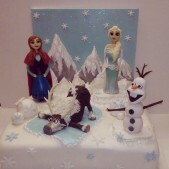 Whether your favourite is Anna, Elsa, Olaf, Kristoff or Sven, we can design the Frozen birthday cake of your dreams! Robin and her talented team of bakers and cake decorators have a wealth of experience in designing beautiful cakes for any occasion. 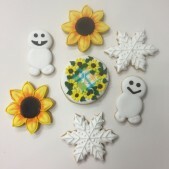 We are a London cake company with a reputation for being creative and original in our designs. A Frozen birthday cake from Cakes by Robin is sure to be a complete show stopper, making your little one the envy of all her friends. 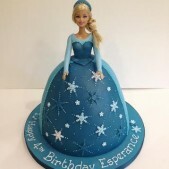 We can create sugar models of any combination of the Frozen characters to sit on top of your Frozen birthday cake. 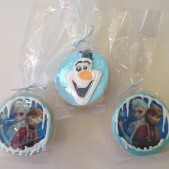 Alternatively, why not choose one of our 2D transfer cakes or have a 3D handcrafted cake – perhaps a 3D Olaf cake? – made especially for you? 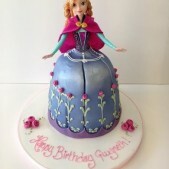 Whichever option you select, our professional cake designers will use nothing but the freshest and finest ingredients to create a Frozen birthday cake that your little princess will love. 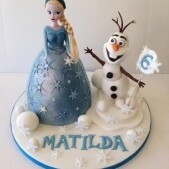 Take a look at our Inspiration Gallery below to view just a few examples of Frozen birthday cakes we’ve been asked to create for some very lucky birthday girls in the past. There’s a selection of scrumptious Flavours and Fillings to choose from, including classic Vanilla Victoria Sponge and Chocolate Fudge cakes. 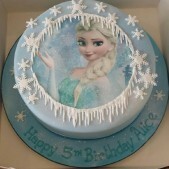 We can cater for many dietary requirements, food intolerances and sensitivities, including Gluten Free Frozen birthday cakes to make sure that none of the party guests have to miss out on a slice of Frozen fun. If you have any specific dietary requirements, please contact us and we will do our very best to accommodate your needs. 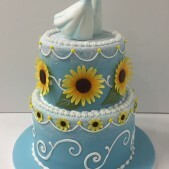 At Cakes by Robin, all our cakes are handmade to your exact specifications. 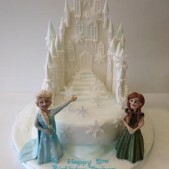 The price of your Frozen birthday cake is dependent on your exact choice and the complexity of the cake design. Please do not hesitate to contact us to discuss your budget. 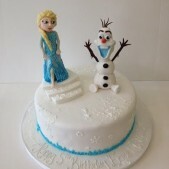 All our Frozen birthday cakes are made to order and created in our South West London studio, with free London delivery available. Our professional design team will be more than happy to discuss your ideas for a Frozen birthday cake, and take your order.